Your story “Chad Works at the IMF Now” appeared in our BELLO issue. Can you tell us a little bit about your inspiration for the piece, and how you feel like you’ve grown as a writer since having it published? That story was the product of a workshop, “30 stories in 30 days” at Eckleberg with the marvelous Christopher DeWan. This BELLO story sought to give a character a super power. Well, meet Chad Hapstack, an accounting shark. I still write about accountants. Heavy Feather Review Volume 7 just published my one-act play, “The Actuarials.” I have an MBA, and always held a place in my heart for Wallace Stevens, the great poet who worked in Life Insurance by day. I would never exchange my luck. If anything I’d look myself in the eye and say: trust your drive, kid. Don’t wait for some imaginary starting gun. Get it done; the clock is ticking. My writing has to suit the energy of being a full-time teacher. It’s a very hard job and requires a lot of stamina, a lot of organization, a lot of creativity. My stories always begin with a pile of scrap-papers and notes, things I thought important and wrote on the backs of envelopes or folded papers. 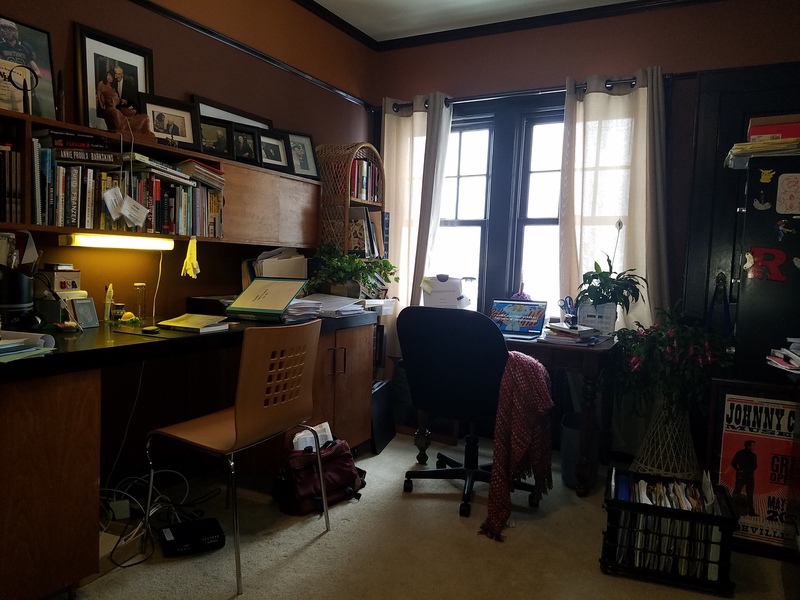 I know there is a penchant to say a writer needs a clean, well-lit place, but my office is a mess. There is something in me that dislikes tidiness, that thinks it dishonest. 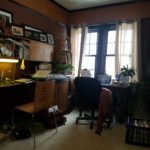 So I have two desks, one is mid-century modern, a long black counter with slider shelves above it, which is great for laying things out and shuffling papers, and the other is a simple wooden shop desk that was once in my parents’s flower store. I am happy to write at either, the little desk of days, the long mid-century nights. I like folk and fairy tales, and regional lore. I like Irish writers. I think what I write are stories about people who could be disappointed, who might wallow in hurt, except there is some heart in them that refuses to abandon wonder. I like characters, narrators, and points-of-view that fill a role: to step forward, sing, and retire. I think absurdly unclassifiable things are everywhere. I recommend the late Brigit Pegeen Kelly. Her poem “Iskandariya” is superb. I think of her and I think of faith. How often in life, one asks for a fish and gets a scorpion, but in due time the disappointment reveals itself a perfect miracle, a perfect metaphor granted: “how rare.” Her poems are narrative. A living artist I find interesting is electronic musician and producer Mark Pritchard. His last two albums, Under the Sun and The Four Worlds, are filled with narratives of sound and image, but very few words. Really inspiring compositions. Pritchard and Kelly are hybrid giants. Three things right now: a collection, standalone chapter stories, and a novel. I have about 100 flash publications behind me, and a couple dozen in progress, so I’m sifting through, grouping, and it’s like having a party with lots of clashing china patterns on a rickety tea table. Delicate choices must be made. I spent most of 2017 writing longer stories, in the 3-4,000 range, in preparation for writing my novel in 2019. So, before I move on to that juggernaut of time and attention, I want to put up a flash monument. I have three manuscripts out at contests now, but the competition is uncanny. The talent is insane, (and maybe I am, too, for throwing down in the thunder dome of contemporary flash.) 2018 is a watershed time, not only to BE a writer but also to desire being a GREAT writer. 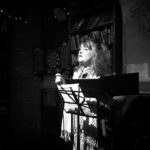 Iron sharpens iron with every publication, and everybody is winning in the language art that is Flash Fiction. I wish every writer luck and contentment.